GOT A PROBLEM? PERHAPS YOU NEED TO CALL THE A-TEAM! THEY’LL SORT IT OUT FOR YOU. America’s hero team goes into action. The A-Team are a group of ex-United States Army special forces troops. They appeared in a television series of the same name which ran from 23rd January 1983 until 30th December 1986, with a total of 98 episodes. 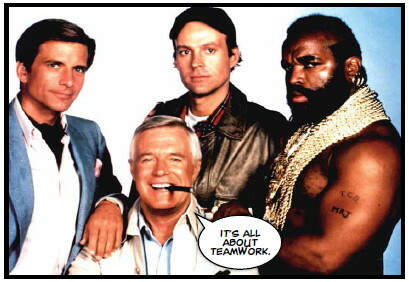 There are four characters in The A-Team. The leader is Colonel John “Hannibal” Smith (played by actor George Peppard). Lieutenant Templeton “Faceman” Peck (played by Dirk Benedict) is a smooth-talkingconman. He’s referred to as “Face”. The team’s pilot is Captain H.M. “Howling Mad” Murdock (played by Dwight Schultz). He has been declared insane and lives in a mental institution, but often comes out to help the team. The team’s strong man and mechanic is Sergeant BA (Bad Attitude) Baracus, otherwise known as Mr T (from the actor’s real surname, Tureaud).